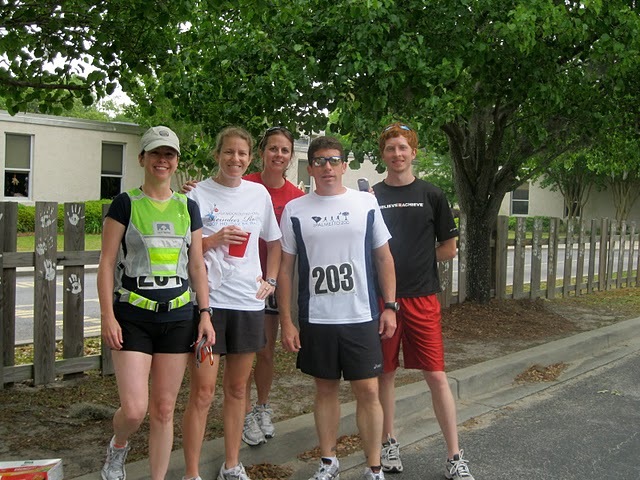 After months of training, the time had come to run the Palmetto 200. 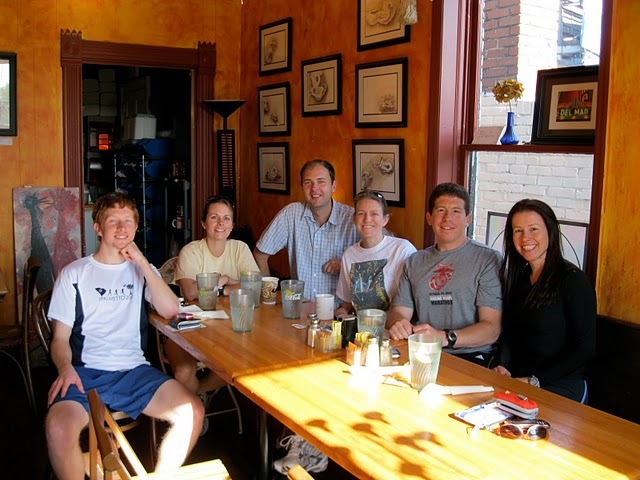 I spent the last week before the race tapering and ensuring I had everything I needed. Thursday night I spent packing and double checking my supplies. I reread the Palmetto 200 web site at least fifty times and then I went to bed. Friday morning I woke up at 4:30am. I ate a light breakfast, showered, loaded my car and kissed my wife and son goodbye (they had both woken up early to see me off - very cool). I was picking up "Cathy's Mom's Van" (I love saying that) in Mount Pleasant and then driving over to Folly Beach to pick up the rest of the team. 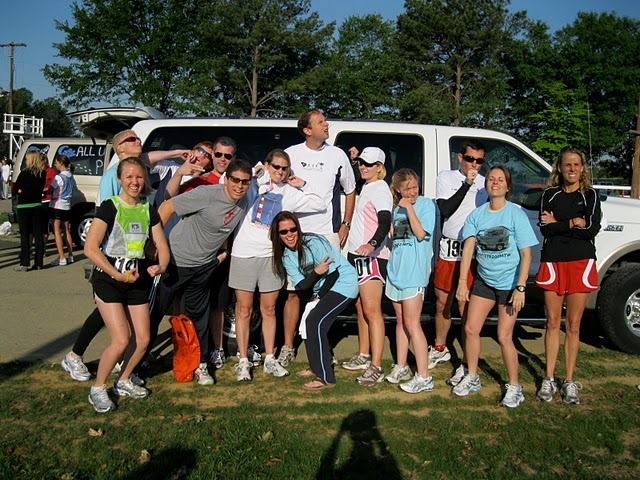 Our team of twelve people was split in half and we had a van for my half (Van #2) and an SUV for the other half (Van #1). 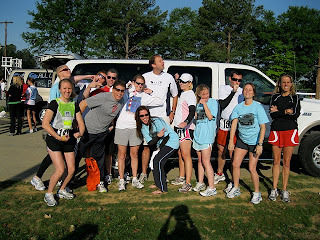 (Van #1): Annie, Jen, Jeff, Michael, Cathy, Stacey (and Jeff's wife Lauren - the driver). 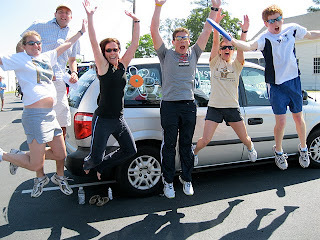 (Van #2): Me, Daphne, Heather, Jon, Betsey, Richard (we took turns driving). The adventure started pretty early. One of Van #1's runners, Stacey, was late; so she met us on James Island and road up in our van. I drove first and of course we stopped at Starbucks before we even left James Island. We made it to the starting line at about 8:15am (15 minutes to spare). The race started at the old Columbia Speedway right outside of downtown Columbia. It was not much to look at, but it was really cool to be starting our 200 mile race on an old race car track (actual race mileage was 201.7 miles). 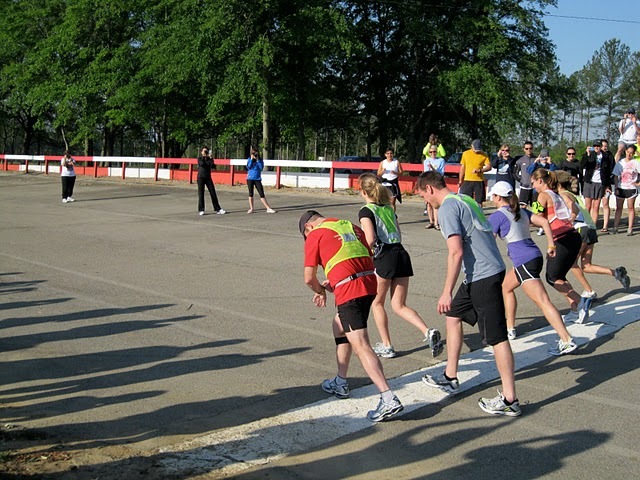 Our first runner was Annie and she made a lap around the track with the other runners and then headed out on to the road. It was so strange standing there watching the start of the race, but knowing that I had over five hours before I would start running. With that in mind, Van#2 made our way to breakfast. That's right, we had breakfast at the start of the race. We went to a cool little place (Cafe Strudel) and I had a bagel and coffee and just enjoyed being with the team. This was a really easy going crew and I was already having fun. Before we got back in the race, we stopped and bought decorating supplies for the van. 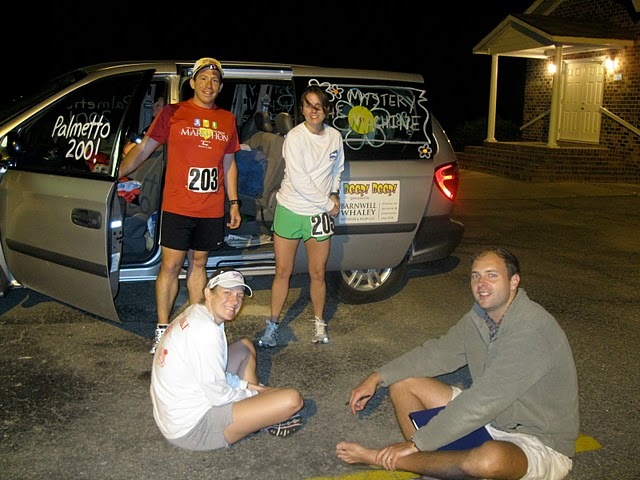 We put the new name of our team on the van - IHNBTDTR200MTW (I had nothing better to do than run 200 miles this weekend) on the back. We then made the van into the Mystery Machine from Scooby Doo (it was so cool and should have won the van competition - just saying...). 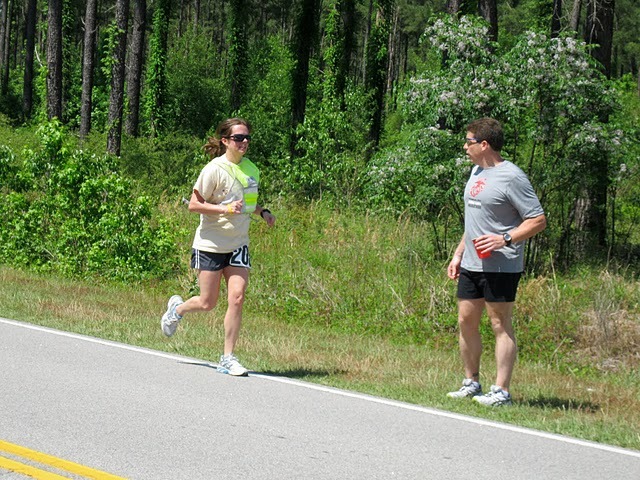 I saw Stacey coming down the road and knew I needed to power through this leg as fast as I could. I started strong going down hill. The road went up a hill for half a mile and then turned through the town of St. Matthews. 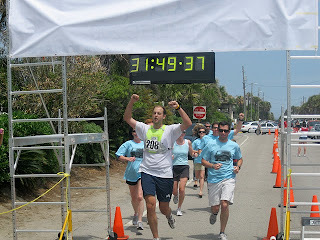 I maintained a sub 7:00 pace the whole way and ended up doing the leg in under twelve minutes. It felt good to get going in the race, but twelve minutes was not even long enough to get me sweating much. I ate a sandwich to ensure I was fueled for my next run. We drove ahead and supported our runner, Daphne, with water and cheers. The road was still hilly and the temperature was really heating up. Daphne handed off to Heather and she handed off to Jon (super fast kid with an incredible attitude). Jon handed off to Betsey and she handed off to Richard (did I mention they are married?). 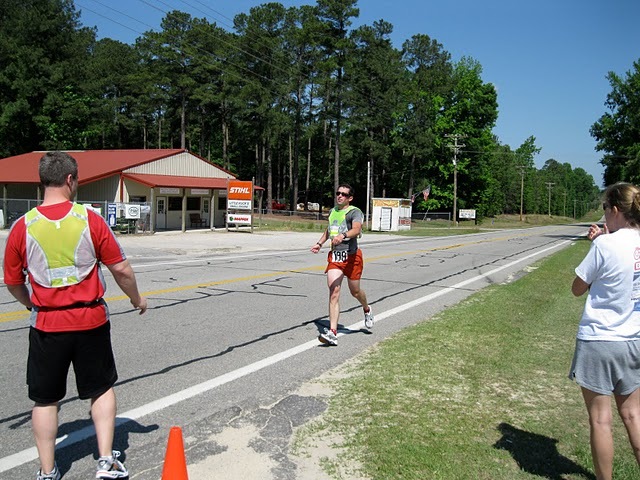 Richard ran a long leg that ended in the Santee State Park. 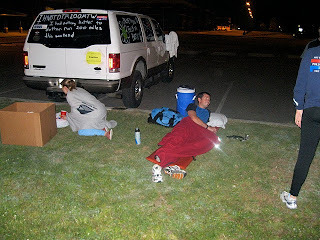 He handed off to Annie from Van#1 and our van was ready to rest. 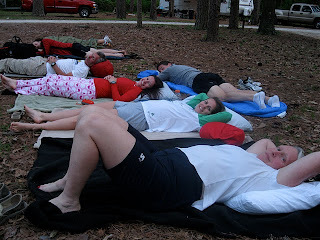 The park had showers and we had rented a camp site for our teams (brilliant idea Richard and Betsey). Most of the group took showers and talked about going to get BBQ. 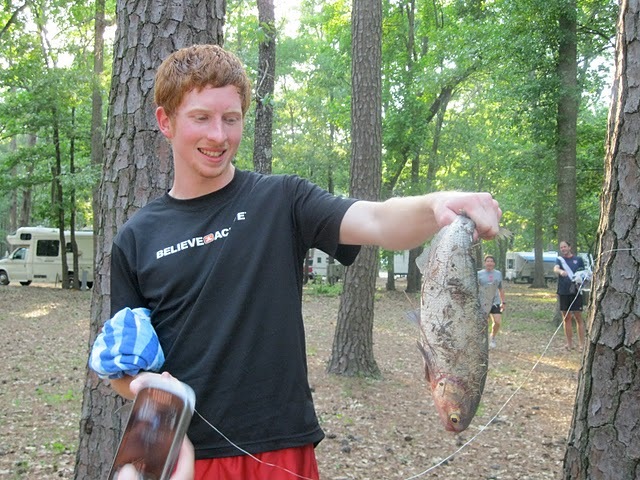 I was checking the camp area for places to buy ice and as I was coming back to the site I could see Jon holding up a big fish! Apparently, while he was standing in the camp site a bird flew over and dropped the fish right next to him (how crazy is that?). Can you imagine telling people that you were injured in a 200 mile race by a fish flying through the air? I was running first again and had a reflector vest on with blinking lights on the front and back. I also had a hat with a spotlight (I looked like a Christmas Tree running down the road). This was a 7.7 mile leg and I felt good right away. It was crazy being out on a busy road and jumping to the side as cars blew past me, but I was having a blast. This is what I had imagined when I first started thinking about this race. This was an adventure! At one point a car pulled over and turned off its lights ahead of me. Our van pulled up next to it and the car took off (freaky). Near the end of my leg, a car pulled along side of me and a lady stuck her head out the window and asked me why all these people were running. I told her that it was a relay race from Columbia to Folly Beach and she just said, "but why are you running?". I said, "to get to Folly Beach." She seamed to take this as a good explanation and said good luck. I waved and said have a good night and she drove off. I ran harder for the last part of my leg and ended at Cross High School. There were volunteers there cheering us on (all the volunteers working this race were incredible!). I changed clothes, had some chocolate milk and then we headed out to support our next runner. We were really staying close to Daphne and Heather during their legs of the race. We dealt with some strange cars and noises and even saw Heather fall down when she hit a pothole. Even though I was finished running, this was one of the more stressful parts of the race (it was hard to relax when knowing our teammates were running in the dark with a bunch of people around that were crazier than us). Jon ran his part of the race really fast and seemed to really be enjoying the freedom of running on a country road in the middle of the night. 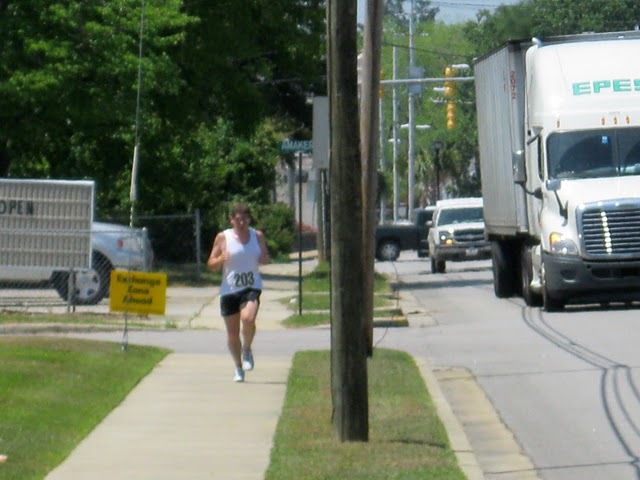 Betsey ran next and had a great leg through downtown Monks Corner. It was nice to have some light as she made it through town. She handed off to Richard for a short 2.3 mile leg up hill. There were a few rain drops at this point, but nothing major. Richard handed off the bracelet to Annie and we were done for a few hours. We were all exhausted and had decided to go to Richard and Betsey's house to shower and get a few hours of rest. We drove about forty-five minutes to Downtown Charleston and dragged our selves into their house. I took a shower and laid down on a bed and fell asleep for about an hour. I heard my phone and checked the text. It looked like Van#1 was ahead of schedule. I just sat there staring at my phone. I could not even think straight... I heard other people moving around outside my room so I got up and made my way downstairs. I could not eat anything (my stomach was a mess), but I did drink some coffee and started to feel ok. It took awhile, but we finally realized that Van#1 was actually still on time and we could have slept another hour (our brains were fried). We loaded the van again and headed to Mount Pleasant for the final part of the race! My last leg of the race (7.3 miles) was a great section (I run in this area all the time). I ran down Rifle Range Road to the Isle of Palms Connector. I passed one runner on that road and could see another runner about one hundred meters in front of me. 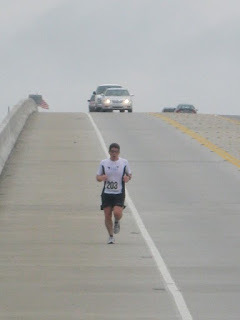 I could feel my pace picking up and I pushed it to the bridge. I passed the runner and pushed it to the top. As I came over the IOP Connector Bridge I saw my team at the bottom and could hear them cheering. It was sick! They gave me water and then I ran down the road to Sullivan's Island. 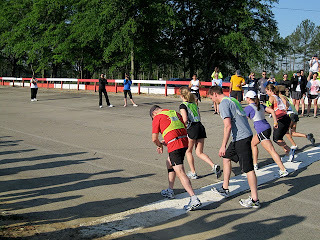 I handed off to Daphne and could not believe my part of the race was over. We followed Daphne over the Ben Sawyer Bridge (we found out later that the bridge had opened a few minutes after she ran over). Daphne handed off to Heather in front of my son's school (Mount Pleasant Academy). It felt good to be back in familiar territory as we went through the Old Village. Heather ran to the Mount Pleasant Water Front Park and handed off to Jon who ran over the Cooper River Bridge. We made it to the exchange and Jon handed off to Betsey. Betsey ran over the Ashley River and then to James Island (she did get stopped by the James Island Draw Bridge). The heat was brutal again, but she made good time and finished her leg. She handed off to Richard and he made his way to Folly Beach for the end of the race. We all lined up and waited for Richard. It was cool to see him running down the road and turning for the finish line. The whole group got behind him and ran through the finish line together. 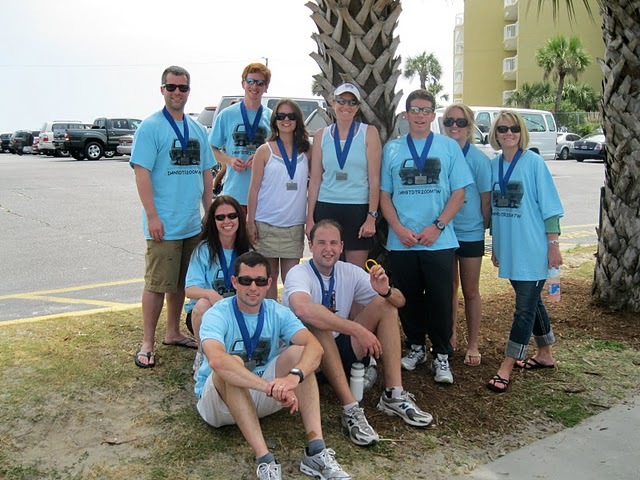 Team IHNBTDTR200TW finished the 201.7 miles in 29 hours and 20 minutes and made the top ten! Finisher medals were given to the whole group and we took some team photos and then we all just kind of stood there amazed at what we had just done. Even though this was the first year of this race it was unbelievably well organized; the route was great (although some parts were a little sketchy); the volunteers were awesome and the experience was priceless. Noah, you and I are so drinking the same kool-aid. Ever since I found out about the relay here, I've been trying to talk peeps into doing it with me. Who knows, Julie may even let me do it now, thanks to you!